“Western star does weird commercials in another country” is a time-honored tradition, padding the bank accounts of actors from Arnold Schwarzenegger to Eddie Murphy. So it’s not wholly surprising that former James Bond Pierce Brosnan might do a commercial in India, riffing on his old superspy persona. (Complete with kung-fu kicks, fancy cars, and a big, bushy beard.) What does come as a surprise—including to Brosnan himself, as it turns out—is what he was shilling for: an addictive, chewing tobacco-like substance known as pan masala. Hired by Indian company Pan Bahar, Brosnan apparently thought he was making a commercial for a “mouth freshener.” Indeed, the commercial prominently displays a label bearing those words on the canister in his hands. But Pan Bahar is mostly known for its pan masala line of products, a mixture of betel leaf and areca nut frequently denounced by medical professionals for its psychoactive properties, addictiveness, and carcinogenic effects. (It’s also sometimes mixed with actual tobacco, just to round things out.) Pan masala is chewed and then spat out, and is noted for the distinctive red stains it leaves on teeth and walls alike. The company’s web site is currently offline, so it’s not clear if Pan Bahar was attempting to branch out into a non-carcinogenic “mouth freshener” product, as well. 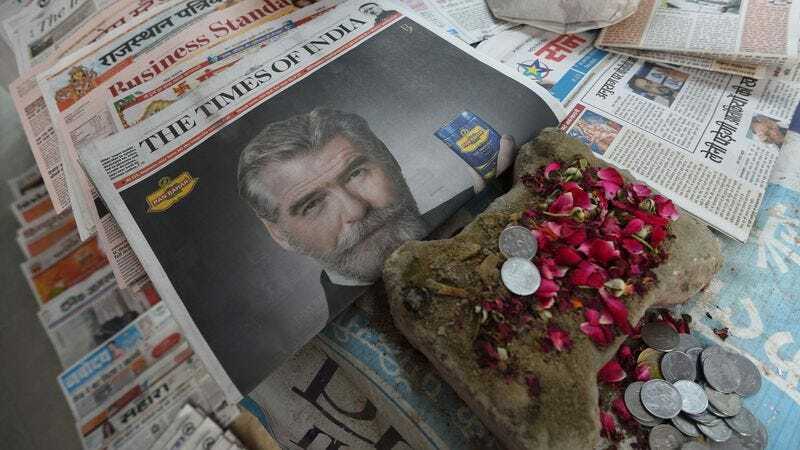 Whether or not that’s the case, though, it used Brosnan’s image for a full-page newspaper ad, showing him holding a container labeled “pan masala”—something Brosnan vehemently denies was part of his contract. “I was distressed to learn of Pan Bahar’s unauthorized and deceptive use of my image to endorse their range of pan masala products,” Brosnan told People, asserting that he’d been hired to promote a single product, an “all-natural containing neither tobacco, supari”—the active ingredient in pan masala—“nor any other harmful ingredient.” Brosnan has been widely mocked online in India for his perceived support of the product, an association that’s presumably made all the more painful by the fact that the actor has lost several close family members to cancer, and has spent years raising funds for cancer research and support. Brosnan is demanding that the ad campaign be pulled.